Completion of Sound View Streetscape Celebrated with Cake, Pizza, Ribbon-Cutting … and Smiles! You are here: Home / Towns / Old Lyme / Completion of Sound View Streetscape Celebrated with Cake, Pizza, Ribbon-Cutting … and Smiles! 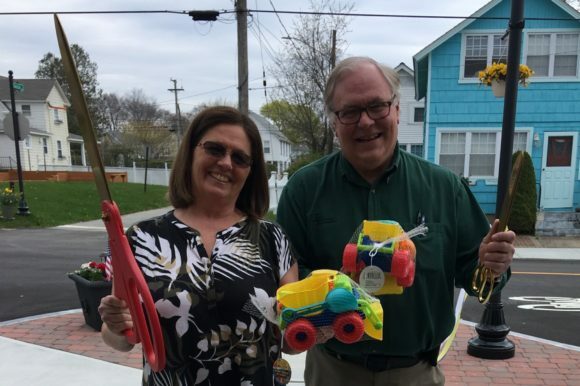 First Selectwoman Bonnie Reemsnyder and Sound View Commission Chairman Frank Pappalardo stand with their ribbon-cutting scissors and symbolic beach construction toys during the celebrations. Photo by MJ Nosal. Around 30 people were present yesterday on Hartford Ave. in the Sound View section of Old Lyme to celebrate the completion of the streetscape improvements on Hartford Avenue at Sound View. The project, for which expenses were refunded up to 80 percent by a federal transportation grant, included new sidewalks, ADA accessible ramps, drainage, a bike lane, bump-outs, decorative posts and paving. All the members of the Sound View Improvement Committee (SVIC), except Arthur ‘Skip’ Sibley who had a prior engagement, were present. Chairman Mary Jo Nosal presented each of them — Old Lyme First Selectwoman Bonnie Reemsnyder, Sound View Commission Chairman and SVIC member FFrank Pappalardo, Angelo Faenza, Jim Lampos, John McDonald and Rob Haramut of RiverCOG — with symbolic beach construction toys. 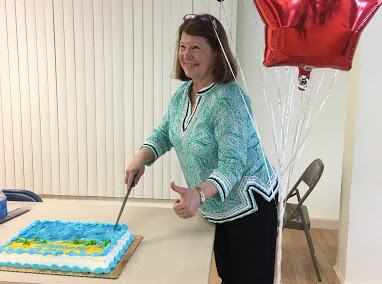 Old Lyme Selectwoman and Sound View Improvement Committee Chairman Mary Jo Nosal cuts the cake celebrating the completion of the Sound View streetscape. Other distinguished guests were representatives from the state Department of Transport and the Inspector Engineer from the construction company WMC. Dee and Jerry Vowles, who are the owners of The Carousel Shop, and Lenny Corto who manages Lenny’s on the Beach, joined a number of other Hartford Ave. residents at the celebrations. Due to the ongoing threat of rain, after the ceremonial ribbon cutting outside on Hartford Ave., the celebratory speeches and consumption of pizza from Teddy’s and cake had to be relocated to the Shoreline Community Center. In her speech, Reemsnyder commended Nosal and her committee for their enormous efforts to see the long-awaited project through to completion.